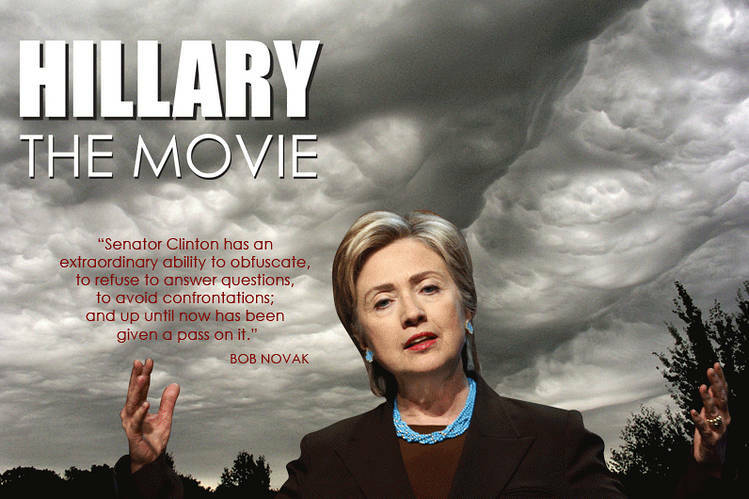 It’s the documentary that went to the Supreme Court and changed everything….this movie is a must-see for anyone still unsure of who they intend to vote for in 2016 …..
She was the first “First Lady” to come under criminal investigation. In both Little Rock, and Washington DC,” wherever Clinton was, trouble was sure to bloom all around her. Meanwhile and yet again, her most recent stint in leading the US State Department has landed her under multiple FBI criminal investigations. Nor is the issue some vast right-wing conspiracy that keeps Hillary constantly in a state of trouble, rather, it’s her hunger for power and wealth, to be procured at all costs and any expense. She will break any rule, obscure any truth, and deflect any charge, that might ever come her way through a conjoined network of political contacts and professional evasion. She has spent a lifetime of avoiding repeated incarceration attempts, due to her fraudulent misadventures–and not even her most ardent supporters believes that she is a truthful politician. Mired in controversy from the start of her political career, she’s one of the most divisive characters ever to enter into American politics. Skullduggery, character flaws, behavioural problems, psychopathic psychology, she couldn’t be elected to dog catcher” were she a Republican, states one political expert. You’ll be needing a goodly supply of popcorn for this full documentary to start and, probably, an anti- nausea elixir upon completion.